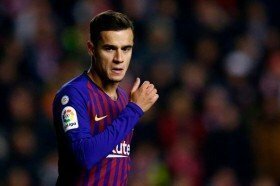 Barcelona midfielder Philippe Coutinho has reportedly turned down the opportunity to return to the Premier League with Manchester United in the summer. The Brazil international left Liverpool to join the Blaugrana in the winter of 2018, but he has since struggled to establish himself as a regular starter under manager Ernesto Valverde. According to Goal.com, the attacker may be offloaded from the Blaugrana ranks in the summer but United are unlikely to win the pursuit of the former Reds playmaker. Coutinho has previously spent five years in the Premier League with the Reds but reports indicate that he is not keen on a comeback with his family having previously failed to settle in England. The Brazilian has made 26 appearances for the Blaugrana in the Spanish La Liga this campaign but only 16 of those outings have come from the starting lineup. He has managed just four goals and two assists in the league this term.